Presidio County Commissioners Court meeting 1-26-2016 9 AM, Presidio County Courthouse Annex, Presidio. John Ferguson: ambulance funding. Says he will run a proposal by City Council to consider running the ambulance service with a 25% funding provision from County in the future. Based around Trans Pecos Pipeline anticipated funding. Seeing that County could have additional funding from pipeline. Says that he will propose this on Thursday night's city meeting. 25% would be approximately $125,000/year. Wants to have County and City on the same page, doe not want to discontinue service to the County. Eloy Aranda asks what the Judge thinks the City of Marfa wants. Judge says City of Marfa is in support of an ESD rather than continuing split services. White says that commissioners should not respond, not on agenda. Hernandez asks what percentage of costs come from outside of City limits. Unknown at this point. End of presentation. Michael Bruders(?) with Honeywell, re County Jail planning for control systems, etc. Met with Sam Cobos at jail to look at systems. Trying to put together a format to develop new systems repair/replace plans and funding options. Using Michael Smith engineering out of Plano. Basic introduction to commissioners. Out of Minnesota. Says current system at jail was OK for its time. Deferred maintenance has cost, but also controls are antiquated and systems are near end of life. Vasquez interested in timeline for a proposal. Brewers says that looking at 3 months or so for basics. Hopefully identify costs and options for next year's budget. Systems include fire, HVAC, electric, gas, etc. Probably return with basic look at proposals by March. Working with Sam Cobos. Judge says she attended a RGCOG meeting and borderplex workforce solutions announced that City of Presidio will have its first licensed child care center later this year. Residents complaining that water is over chlorinated. Public water system must have a board in place. No board currently. Candelaria residents may need to appoint a board. Meter reader lady says that accounts share meters, etc to thwart fees. Need more meters. Hernandez says that Stormy Noble is working on it, should show up to meeting today but not here yet. Hernandez says that although the residents run their own system, they need help with organization and everything else. State is coming in very soon. Will need an electrician to work on control panel, will need a plumber and someone I'll need a Class D license to operate system. Stormy Noble and Jim Bloomberg say they will help. Judge says they need a treasurer. Stormy will need to go to class for Class D certification. Hernandez is trying to set up a meeting with the majority of residents to come up with a plan. Judge: continuing education for commissioners with TAC. Info in packets for commissioners. Judge: two indigent burials this month in county. Judge is working on an official policy for these burials. Will include a possibility that Judge could investigate whether people are truly indigent before county pays for burials. Memorial Funeral Home in Alpine charges $1200 for each. Two people this month from Presidio. One had no relatives at all, one had a niece. No provisions for County to truly tell if these folks are indigent. Judge will work on a policy and get some legal advice on cremations, options, etc. Commissioner Aranda: TCEQ email requesting that County clean up spilled oil in Presidio yard. Will answer to agency by Feb 14, being cleaned by road and bridge. Discussion with action requiring all county dept heeds and employees that have grant purchased or county purchased vehicles to maintain logs. White makes a motion to require. Some discussion, homeland security requires it. Vasquez seconds, unanimous. County Treasurer has logs available. Item 7: Submit logs to Treasurer on a monthly basis. 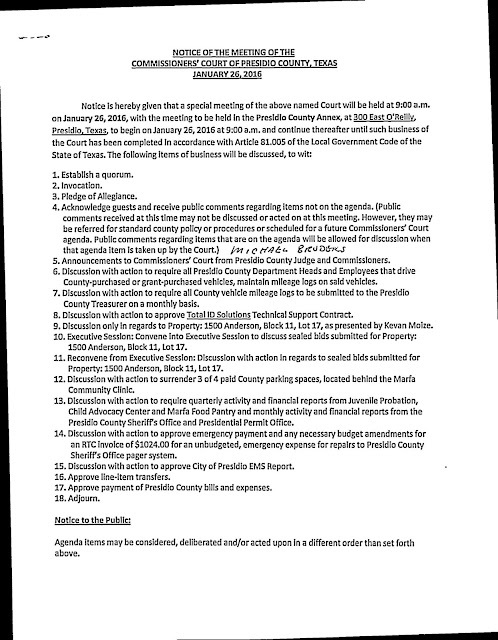 Item 8: Renewal of service contract for jail ID database for employees and other officials. Laminated badges, etc. Equipment has already been purchased, this is for annual software support contract for firm that provides it. Sheriff's office wants to pay for this out of abandoned motor vehicle fund. This also may be for technical support. Some confusion. White says we need to find out. Brought by Sheriff and wants purchase order. Must be approved by commissioners court. Vasquez wants to table item until next meeting to get more information on what exactly this is. Vasquez so moves. Judge recommends no action. Hernandez wants to put it on next agenda. White wants a presentation not. Sheriff but by company. Motion to table accepted. Kevin Moize: property owned by County to be potentially sold. Gonzalez street property, Anderson addition. Presentation with regard to property. Taxes have not been paid in years. Appraised value of property is 7,460 to now 11,630 dollars. Much vandalism. Searched for owner. Auction occurred and minimum bid was much more that value. Now makes proposal to sell the property to him. Judge has no questions. White has questions. Asks Ruben Carrasco about property. Ruben says that he investigated property. Had trouble finding property. Found it, but boundaries of property unclear. It is the old ice plant, next to IBWC. West of football fields in Presidio, across from AEP plant. White clarifies that it is in a good location. Judge says this is discussion only item. Next item is executive session on same item. Aranda asks what plans are for space. Moize says he wants to use it as an art studio. Executive session convened at 10:04 AM. Return from executive session at 10:22 AM, reconvene into regular session at 10:24 AM. Action on property at 1500 Anderson. White moves to eject bid. Unanimous. Next item:To rescind 3 of 4 parking spaces behind Marfa Country Clinic back to city. Currently pay $5 a year to city. Judge thinks three spaces should be abandoned and keep one for eventual storage of veterans officer car. Judge makes motion, White seconds, unanimous. Item: to require monthly reports from Sheriff's Office and quarterly reports from Probation Office, Child Advocacy, Food Pantry. Aranda makes motion, seconded by White. Unanimous. Item- emergency purchase: invoice for repairs to Sheriff's office pager system. Unbudgeted repairs. RTC Corp. Jeff Davis County has lent a system to county in meantime. Costs could come from dispatch budget or make a line item budget transfer. There is money in dispatch at this point. Patty Roach clarifies. White asks what the best way to do this is. Patty says there's not a lot of difference. Judge makes motion to take it out of jail fund balance and put into dispatch. Item- City of Presidio EMS report. Submitted for approval since it was not submitted last time. White says he does not see a financial report in their report. Agreed by other commissioners. No financial report included, only an activity report. White says that commissioners need a financial report to understand how money is being spent. How can commissioners court understand how expenses are incurred without a detail. 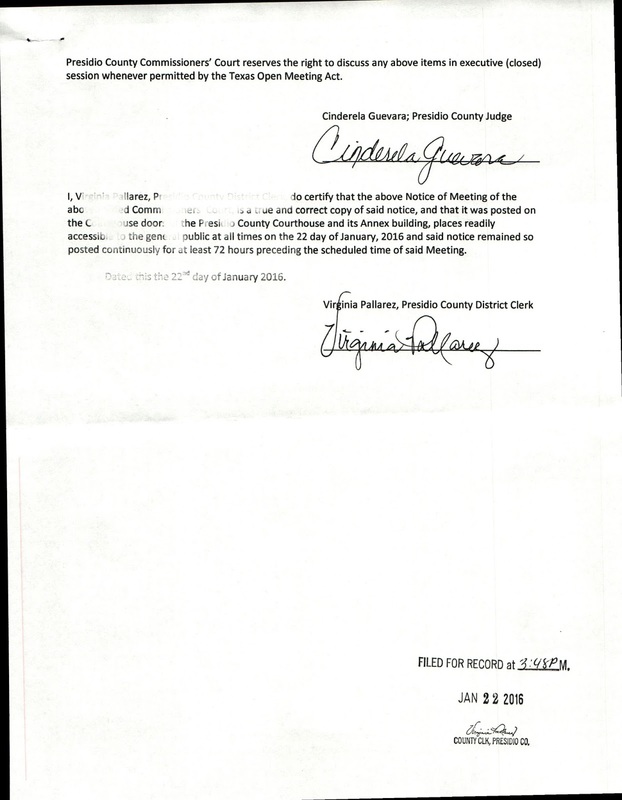 Judge says she will make sure that Presidio EMS has received the format commissioners approved for submitting reports so that county can get the right info. White says he would like to see Presidio EMS re-submit the report with financials. Just passed that format last month. Judge mentions that she has still not seen City of Presidio 2016 budget despite certified mail request. Hernandez moves to accept and make sure next report includes financials. Vasquez seconds. Approved. Emergency management- truck repairs, $200 for new tires, old tires dried out. Transferred from capital outlay. Parks and Wildlife traffic tickets: county keeps only 15% of game warden tickets related to game warden jurisdictional offenses. Transferred by treasurer back to State. Chase wants to add an expense for hangar door replacement at Marfa airport. Wants to use a proven door company. Company needs a 20% deposit to begin fabrication. Wants to add total cost of doors, send in two payments. In budget. 50% reimbursable by RAMP grants. Patty Roach concerned about paying anything for something not received. Uses Brewster County as example with their vehicle they never received after supplier declared bankruptcy. Chase counters that this is a low-risk situation. Hernandez agrees with auditor. Discussion. Down payment listed on approval of bills. Patty Roach says that is now the issue; $3147.00 up front with nothing received. She says she is OK with down payment amount as limited risk to county. Agenda item for next meeting would be a C.O.D. amount total with currently unknown shipping costs for receiving door system in good condition, according to Patty. Total cost of doors plus installation estimated to be $36,000 +/-. Hernandez mentions costs of AT&T services. Frances Garcia says that company responded to inquiry on rates. White ask about Big Bend Telephone. Judge says she has not yet heard back. Need presentation from BBT. Hernandez asks about number of phone lines per office. Katie Sanchez says John is working on how many phone lines, how much lines cost, etc, per office and countywide. Huge numbers. Hernandez would like to see offices reduce number of lines. Discussion about costs of long distance versus cheaper cell phones, etc. Judge will call BBT after meeting. Vasquez wants an item on next agenda. Frances Garcia looks for invoice, Tom's Texaco. Bill for filters, oil change, tire rotation, car wash, etc. Katie says the County spent about $98,000 on communications last year. More discussion. Final S&B consulting/engineering bills of approx $200,000 and $70,000 are submitted. Port of entry/bridge expansion costs. Reimbursed by grants. Katie says County earned a little bit of interest of those monies while we held it. Bills approved except for one for $230.00 for Sheriff's Office with incomplete information.